Why are Noise Cancelling Earbuds So Popular? What Types of Noise Cancellation are There? 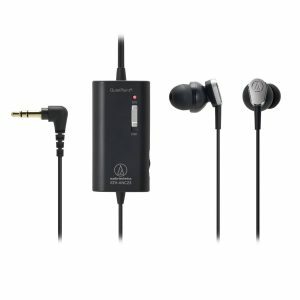 How to Find the Right Pair of Noise Cancelling Earbuds? Why are noise cancellation earbuds so popular? Why and when we need them? How to find the pair that satisfies all our needs? These are only some of the numerous questions that will be answered in the article about 20 best noise cancelling earbuds. We decided to look into the matter because we were intrigued by the popularity of noise cancelling headphones. This time, we have focused on noise cancelling earbuds specifically because we wanted to find out what does noise cancellation mean and what kinds of noise cancellation exist. We were also wondering if that technology was really efficient and why some of the products that use this technology cost so much. Because of all previously mentioned reasons, we suggest you stay with us and find out everything you didn’t know about noise cancelling earbuds. Our list contains 20 best models of noise cancelling earbuds that we could find on the market. They are very different, not only because of their characteristics but also because of their prices. All in all, we have prepared a lot for you and we are sure that you will be able to find some interesting models that suit your taste best. Noise cancellation is one of the relatively new technologies that many headphone manufacturers use. You won’t find noise cancellation only on earbuds; you can also find it on other types of headphones such as on-ear or over-ear headphones. Earbuds have always been extremely popular type of headphones. Many people claim that they can’t stand earbuds, but those customers aren’t numerous enough to affect the popularity of those small headphones. They are small, light and practical; many people decide to buy them because they can easily throw them in their pocket and take anywhere they want. That way, the earbuds are always near in case the owner needs them. The earbuds are also being constantly improved and their sound quality gets better. Some of them can even compete with their larger cousins – full-size headphones. When you add technology like noise cancellation is, we consider it completely logical for so many people to love these headphones. Noise cancellation allows you to isolate yourself more or less from the noise around you. These earbuds are ideal for everyday use for all the people who commute, travel, work in crowded offices or simply spend a lot of time in crowded places. If you are one of those that live in big cities, you will perfectly understand what we mean by background noise. Car engines, busses, people constantly passing you by talking to each other or making calls; all those things cause noise and can get really annoying. So, if you want to save yourself from the jungle out there, the next reasonable step is to buy one of the models of noise cancelling earbuds. We assume you often see adds for noise cancelling headphones. Those adds don’t entirely explain what they mean by the term and people often get confused because they think their headphones use some kind of technology they don’t really have. That happens because there are two types of noise cancelling technology and there is a great difference between them. One of them is ANC (active noise cancelling technology), while the other is passive noise cancelling technology that is more commonly known as noise isolation. When people see that some headphones are noise cancelling, they often think they will get ANC headphones. Sadly, that’s rarely true, especially if the headphones are quite cheap. We don’t want to imply that passive noise cancelling is bad, but we have to point out that those two technologies are very different. Each of them does its job nicely, but the customer gets quite different results and in the text below, we will explain it thoroughly. Active noise cancellation (also called active noise reduction) is technology that is still quite rare in comparison to the total number of headphones on the market. Only a few companies make these headphones and most of them are quite expensive. Active noise cancellation works based on interference process. Every sound that comes from the outside world is actually one sound wave. If your headphones use ANC technology, their speakers will create special sound waves with the same amplitude but different phase. In the process of interference, the waves cancel each other. As a result, you hear no background noise, at least most of it. Of course, ANC is not perfect and it mostly helps with lower frequencies as engine noise, but they won’t shut out the sound of baby crying. They also require special battery that enables normal functioning of ANC and it can sometimes change the quality of sound, so many customers are surprised during the first use of such headphones. Passive noise cancellation is incomparably simpler than active noise cancellation and that’s because it is not the real technology. In fact, it depends only on the physical characteristics of your headphones. For example, over-ear headphones have the best and the most efficient passive noise reduction and that is because of the shape of the cups. They are big, they have thick pads and they cover your ears completely blocking most of the background noise. On the other side, earbuds are small and they can block significantly less noise, but they can still be very effective. The way their noise reduction works is based on the shape of their ear tips. They are inserted into your ear canal and they seal it so that you can hear fewer background sounds. The only condition that should be completed is to find the right size, shape, and material of the tips. The tips can’t be too tight or too loose and they have to be made from the material that adjusts nicely to the shape of your ear canal (foam for example). Bose QC 20 are one of the very expensive models of acoustic noise cancelling earbuds on the market. However, their price can’t diminish their quality and their popularity can only grow in the future. They come in black/grey and white colors and in Apple and Android-friendly versions, they weigh 1.5 ounces and they deliver amazingly pleasant sound. If you take into consideration that Bose is one of the most important companies that produce noise cancelling equipment for cabin crews, you can be sure that you won’t make a mistake if you spend your money on these earbuds. As you could expect from a company like Bose, you get a very rich package. 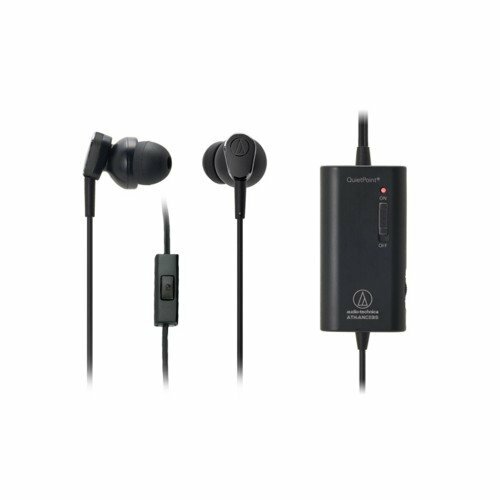 The earbuds come along with short USB charging cable for charging the battery responsible for activating the acoustic noise cancelling, zippered soft carrying pouch, three pairs of ear tips in different sizes and a user manual, which should be read carefully. Bose QC 20 look rather attractive and they can be used in any situation. They are great for casual walks, busy days in the office, but also for workouts because of the sporty design and great stability. The earpieces are relatively small and they don’t stick out from your ears too much. The ear tips are made from silicone and they come in 3 different sizes, so you can find the one that suits you most. The tips have ear wings that ensure more stability, especially during working out. The audio cable is long enough to allow you to move freely and still not make a mess in your pocket (132 cm). It is Y-shaped and on the joint, you will find control pad with control buttons and inline mic. On the lower end of the cable, you will find noise cancellation regulator. It contains rechargeable battery and control buttons that allow you to activate or turn off noise cancellation whenever you need. The regulator is rather light and thin and the battery needs 2h to be fully recharged. After that, you will be able to use it up to 16 hours. At the end of the cable, there is L-shaped universal 3.5mm connector. QC 20 are well-built earbuds all the way from earpieces to the rounded cable and L-shaped corrosion-free connector. The cable is thin, but it is quite durable. It is not stiff thanks to the rubber built. Besides that, these earbuds are extremely comfortable thanks to the angled design of the earpieces and weight. Of course, it wouldn’t be the same feeling without the ear tips with the wings that prevent the earpieces to fall out from your ears no matter what you do. When you find the right size of the tips, you will be able to enjoy double sound cancellation; acoustic and passive. The noise cancellation regulator controls the electronic version, while the perfect seal that the tips make regulate physical noise isolation. One of the most important things that we like about QC 20 is the way they sound. As you could guess, it is amazing. The earbuds have built-in equalizer which makes the sound more balanced. The bass is strong and punchy, while the acoustic noise cancellation will definitely enable you to take a break from the outside world. Bose QC 20 don’t have many flaws, but we have to mention them. As far as the design and build are concerned, people complain about NC regulator that is covered with latex and collects a lot of dust. One of the issues is in the sound quality department. As you could expect, noise cancellation technology diminishes the effect that the sound of QC 20 leaves on you. TT-EP002 are affordable earbuds with active noise cancellation technology that can be used in all situations, from sleeping to working out. Just like Bose QC 20, only inexpensive and with lower sound quality. They have very powerful battery that needs to be charged for only 1h in order to provide up to 15h of ANC. It is not too powerful, but it can reduce up to 25dB of external noise, which is quite good. Besides that, the headphones are extremely lightweight (0.8 ounces) and comfortable, so using them will be pure enjoyment. TaoTronics EP002 come nicely packed. They are accompanied by short USB charging cable, user manual, airplane adapter, numerous spare ear tips in different sizes (along with 2 spare pairs of ear wings) and soft carrying bag. The earbuds might seem a bit boring to someone, but we love the simple design and all-black style of TT-EP002. They have metal matte finish, which makes them quite elegant and suitable for all situations. These are wired earbuds. They have Y-shaped audio cable that ends with 3.5mm straight connector. The mic, volume controls, and multifunctional button are on the right side of the cable, while the noise cancelling regulator is located on the joint of the left and the right sides of the cable. The regulator is quite light and thin, it allows you to switch between two modes – ANC and monitoring that can be turned on anytime you need to be aware of everything that is going on around you. These earbuds are mostly made from aluminum, which makes them highly durable in spite of the affordable price. Apart from that, the earbuds are also very comfortable. They weigh almost nothing, the tips are so pleasant that many people use these earbuds for sleeping and the NC regulator doesn’t make a mess in your pocket. When it comes to sound quality, TaoTronics EP002 aren’t as good as Bose QC 20 but they have more than satisfying sound. They aren’t the right choice for any audiophile, but any ordinary person would be fine with it. The ANC technology works fine and even the people who use the earbuds for sleeping were satisfied with it. TT-EP002 don’t have serious flaws, but we would like to mention that the audio cable is not too strong and that you shouldn’t expose it to severe usage. Besides that, we would like to hear clearer sound with more pleasant bass. The earbuds sound good the way they are, but more clarity would make better general impression. Cowin HE8D are good-looking earbuds that are so elegantly designed that some can mistake them for a piece of jewelry. These earbuds aren’t cheap but they have everything a decent pair of earbuds should have. They are Bluetooth earbuds with strong battery that can last from 10 to 15h, 33-feet signal range, active noise cancellation technology, noise cancelling mic, up to 40kHz frequency response and all that in a product that weighs only 0.48 ounces. They can cancel up to 48dB of sound and survive contact with sweat (thanks to IPX4 rating). 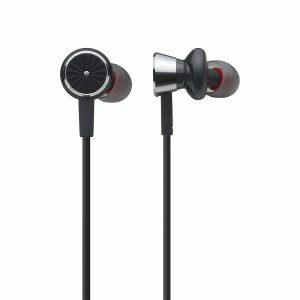 HE8D come with the user manual, spare ear tips in different sizes, zippered carrying case and USB charging cable (OTG magnetic charger). One of the things we like the most is that these earbuds are different from the others. Starting from the design, the earbuds come in black/silver color combination and they look rather attractive. The cable is very thin in comparison to the square earpieces and the magnetic charger/clip on the cable. There is also the control pad with inline mic, multifunctional button and volume controls. The charger is most certainly unique and it is responsible for supplying the powerful battery. When it comes to build quality, Cowin HE8D seem well-built and durable. The cable is strong and not as nearly as thin as it looks in comparison to the earpieces and the Bluetooth module. 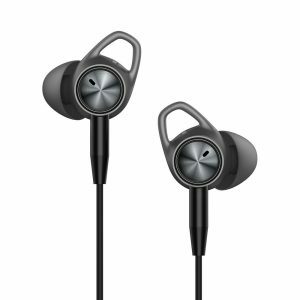 Besides that, they are lightweight and they snug nicely into the ear canal, which makes them great for working out, apart from the fact that they are covered with nano liquipel coating that prevents sweat and moisture from damaging the earbuds. The earbuds have very special charging technology. It is most certainly different from the others, but it has its good sides. The charging module is on the audio cable. Along with the earbuds, you will receive OTG magnetic charger. On one side, it has magnet while micro USB port is on the other side. That means you can easily charge your earbuds using any device with micro USB charging port, even your phone. HE8D sound powerful. Their 1.57-inch drivers deliver quite a sound. They can brag with powerful deep bass and great ANC technology that even makes the earbuds sound better. The earbuds are adequate for listening to any kind of audio or video content, even podcasts and audiobooks. We do like the design of Cowin HE8D, but we have to admit that it is not very practical, especially for the gym. The components that were added to the cable can cause the earpieces to fall out from your ears as they can cause weight misbalance and rip the earbud out from your ear. Besides that, the magnetic charger might be unique, but it is not very practical. You can charge the earbuds with the help of your phone, but only if you plan to listen to music on another Bluetooth enabled device, because the charging process will drain out the phone’s battery. In addition, we really appreciate ANC technology, but the negative side is that it can’t really be turned off. OVC H15 are cheaper than many other active noise cancelling earbuds but they still manage to offer quite a lot for different types of customers and preserve amazing sound quality. The earbuds are wired, they come in black color with the long braided cable with the control pad and special ANC regulator. At the end of the cable, you will fthe ind 3.5mm L-shaped connector. The battery responsible for activating ANC can live up to 60h per single charge, which is really amazing. H15 also have dual driver technology, which actually means they have 2 drivers per earpiece. One of them is responsible for playing music and it is 6mm large, while the other, the 13mm driver, is responsible for ANC. H15 come in a nice cardboard box, nicely tucked into protective plastic. Along with the earbuds, you will receive micro USB charging cable, user manual, airline adapter, thin carrying bag, cable clip and spare silicone ear tips in different sizes. 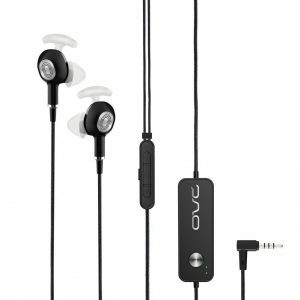 OVC H15 are very interesting earbuds. They look really nice and they are quite light in spite of the ANC regulator. The earpieces are a bit larger than usual, but that is because of the dual drivers. They are also slightly angled, which means they have ergonomic design that increases stability and makes the earbuds more comfortable. The ear tips are made from silicone. They are quite soft and pleasant for wearing even for many hours straight. The ear wings are there to make the earbuds more stable. Control pad with multifunctional button, volume controls and inline mic is on the braided cable. Below the pad, there is ANC regulator with big round on/off button, micro USB charging port and bass enhancement button. That way OVC enables you to listen to your music with or without ANC just like you can choose whether you want to listen to your music with some extra bass or without it. The earbuds are nicely built. They feel quite solid and strong, at least the earpieces and noise cancelling regulator. When it comes to sound quality, we must say we are very satisfied. These earbuds sound amazing in any mode. ANC works nicely. It doesn’t block all the noises, but it definitely eliminates most of the ambient noise and we are sure you will be satisfied, mostly because ANC doesn’t affect sound quality. With the ANC on, the earbuds will be a bit quieter, but they will still sound great. Besides that, the sound without bass booster is very good and incredibly clear, while it gets less clear but more powerful when the bass regulator is turned on. Besides the fact that the earbuds are generally great, we have to mention that they don’t have perfect built quality. The cable is braided and it should be durable but there were cases of breaking especially on the joints. It also causes occasional microphonics, so we advise you to use the clip to attach the cable to your clothes. Linner NC50 are Bluetooth 4.1V earbuds with powerful battery that offers up to 13h of playback time (with ANC off) or up to 9h (with ANC on) after only 2h of charging. They weigh 1.3 ounces, they are pleasant for wearing and they manage to eliminate up to 28dB of ambient noise, their signal range is up to 33 feet and they are also sweat proof thanks to the IPX4 rating. As you can see, they offer quite a lot for the price, which is not so small, by the way. The most important thing is that you get to choose whether you want to listen to music with or without ANC. NC50 come with 3 pairs of ear tips in S, M and L sizes, 3 pairs of ear hooks, user manual, hop pocket, one USB charging cable and a thin carrying bag. The earbuds have amazing and ergonomic design ideal for long hours of listening to music or any audio content, even in the gym. They come in black and blue colors with nice matte finish and the entire surface of the earbuds is nicely rubberized. They are pleasant to touch and wear. The earpieces are angled, they follow the shape of human ear canal and the ear s on the tips can help a lot to improve both comfort and stability. On the right side, you will find control pad with multifunction button, built-in mic and volume controls. Below the pad, there is ANC regulator with USB charging port. If you press the button once, you will activate ANC, if you press it again, you will turn on monitoring mode. If you press and hold the button for 2 seconds, normal mode will be back on. NC50 are well-built earbuds. They seem not only comfortable but also quite durable. If you add IPX4 rating that keeps them safe from being damaged by sweat, you realize what a great pair of earbuds you are buying. The cables are flat and tangle free and the magnets in the earpieces keep them together. If you want to wear the earbuds around your neck while not in use, this is very useful feature. That way, you won’t damage or lose your earbuds. . When it comes to sound quality, the earbuds sound great. Truth to be told, they aren’t audiophile-level earbuds, but any ordinary bass head that likes ANC will be more than satisfied. The earbuds have slightly exposed bass, the sound in general is interesting, energetic and dynamic. The Bluetooth works nicely, the earbuds are easily pairable with both Apple and Android devices and the signal range can stay stable even if some thick walls are on its way. Most of the Linner NC50 problems are in ANC department. One of the most annoying things is the buzzing that you can hear when ANC is on and there is no noise around you. Besides that, the volume changes a lot when switching between monitoring and ANC modes. Monitoring mode is there to keep the music at low volumes so that you can be aware of the things that are happening around you. It is normal that the volume increases a lot when you turn ANC on, but if you aren’t prepared for that, it can scare you. Besides that, it is obvious that the earpieces look a bit bulky in ears and that doesn’t look very attractive. Meidong HE8B are stylish earbuds that remind us a lot of the Cowin HE8D. Although their design is quite different, it has the same base – OTG magnetic charging. The magnetic clip on the audio cable should be connected to the magnetic part of the charging cable in order to start the charging process. The earbuds are wireless and the battery can ensure up to 7 hours of listening to music. They reduce up to 32dB of ambient noise, they have 13mm drivers and they weigh only 0.5 ounces. The earbuds come with micro to OTG charging cable, user manual, protective zippered carrying bag, three pairs of ear tips and three pairs of ear wings for extra stability. One of the things we can’t deny is that these earbuds have very stylish and elegant design. They come in all-black version and they have diamond-shaped earpieces, which look rather attractive. They are a bit angled so we can say they have ergonomic shape. One the right side of the audio cable, you can see control pad with the mic, multifunction button and volume controls. There is also one button that allows you to turn ANC on or off, depending on the situation or your preferences. Considering the materials used, the earbuds should be quite durable. The cable is rounded but strong and it seems resistant to tangling and pulling. Besides that, the earbuds are quite light and quite comfortable as well. In case the original ear tips don’t fit, you can always try on the others and we are sure you will be able to find the pair that fits the best. Also, we recommend using ear wings as they ensure extra stability, which is a must in case you use the earbuds for workouts. The interesting thing about these earbuds is the way they charge. You won’t have to plug them in the wall socket. It will be enough to connect the magnetic clip to the magnetic part of the OTG magnetic charger and the other part of the cable to some of the devices with micro USB charging port. That means, you can charge the earbuds even with the help of your phone. When it comes to sound quality, HE8B sound satisfying. The earbuds are quite clear and pleasant, but they can be pretty loud. ANC works nicely, just like the inline mic. It won’t be able to cancel all the ambient sounds, but most of the low tones as well as some high ones will be successfully shut out. First of all, HE8B have some problems wthe ith design. They are basically extremely light earbuds, but the problem is that the control pad and the magnetic charger can make the earpieces to fall out from your ears. Besides that, there is always the risk of losing the clip and without it, there is no charging. Second of all, these earbuds don’t have mind-blowing sound. The problem is flat and weak bass. 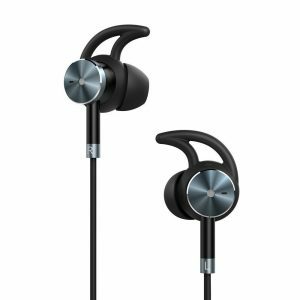 TaoTronics TT-EP01 are very comfortable aluminum earbuds that use active noise cancellation technology. The battery responsible for powering up the ANC is quite durable and ensures up to 15h of playback time. They weigh slightly more than 1 pound and they practically have everything you might need – long-lasting battery, durable construction, inline mic for answering calls hands-free and the technology that shuts out the noisy outside world. Besides that, the price is more than reasonable. The earbuds come with user manual, airplane adapter, micro USB charging cable, 3 pairs of ear tips and 3 pairs of ear wing. TT-EP01 look fantastic. Their all-black design and brushed-metal built makes them look very professional and elegant. The earpieces are ergonomically designed and angled in order to achieve better fit. The ear wings/hooks are there to provide more stability and prevent the earbuds to fall out from your ear canal. The 55-inch long audio cable is quite durable. It is Y-shaped and on the joint of the two shorter cables that go to the earpieces, you will find control pad with multifunction button, inline mic and volume controls. Below the pad, there are ANC regulator with USB charging port and the button that turns ANC on/off. That means that you don’t have to be isolated from the outside world all the time. For example, if you’re working out in the gym, you can turn on ANC and shut out the noises, but if you want to go for a run and you want to be aware of the situation, ANC can stay turned off as that is safer for you. Apart from being very durable (thanks to the metal built), TT-EP01 are extremely comfortable, too. The manufacturer provides you with spare ear tips and wings. There are different sizes and you can find the one that seals nicely your ear canal without hurting it. Once the perfect fit is achieved, you can be sure that the earbuds will be comfortable even after several hours of wearing but they won’t fall out. TT-EP01 sound great. They have pleasant punchy bass and they are generally quite clear. The ANC technology works fine and eliminates most of the ambient noises, even at the very crowded places. In spite of all the good things, we have to notice one flaw of the ANC technology. When you activate it, you will hear some kind of hissing that won’t stop unless you turn off ANC completely. The hissing sound is hardly noticeable at higher volumes, but if you’re listening to some quiet and calm music, it can be very annoying. ATH-ANC23 are nicely designed, relatively small, wired active noise cancelling earbuds. They weigh 1.5 ounces and the ANC regulator is relatively small and light so you can wear it in your pocket. The cable is Y-shaped. It is rubberized, 4.5 feet long and it has L-shaped 3.5mm connector, but it doesn’t have control pad. Volume controls and ANC on/off buttons are on the ANC regulator. In each of the earpieces, there are small mics that pic up ambient noise. The price is average. The earbuds come in a rather simple partially transparent box. The moment you take the box out you can immediately see how the earbuds look. They are accompanied by airplane adapter, replaceable AAA battery, cloth carrying bag, 2 spare pairs of silicone ear tips in different sizes as well as one pair of foam ear tips. The earbuds are simple but attractive. They have angled earpieces with silver front part with AT logo. The spare ear tips in different sizes are available, so you can try them all and try to find the best fit. In case they don’t match your ears, you can always put on the foam tips that usually make better seal and adjust easier to ear canal. The ANC regulator is quite portable, so you just put it in your pocket and it will be always there if you need to turn on or off the ANC. ATH-ANC23 are decently durable earbuds in spite of the seemingly cheap design and very thin audio cable. They are comfortable enough for wearing at home or office, even moderate physical activity. The sound quality is more than satisfying and bass lovers would be thrilled with its strength. The ANC works nicely, although not perfectly. We could even say that they have better passive noise cancellation than active. However, the fact that these earbuds have replaceable instead of rechargeable battery could mean they are more durable as rechargeable batteries have limited life (limited number of charging cycles). The replaceable ones are used, thrown away and replaced by the new ones. Truth to be told, we expected more from a pair of ATH earbuds. First of all, they don’t have control pad and you have to turn on/off music, answer calls and skip tracks on your phone, which is less than the competition has to offer. Second of all, not all customers find the earbuds comfortable. Some of them claim the earpieces are too long and that they stick in your ears too deep. Last of all, the ANC could definitely be improved. It works fine, but it seems that they are worse than competitors. 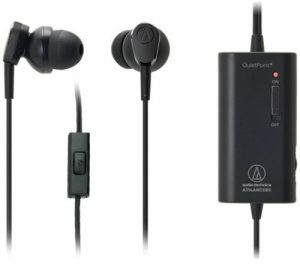 Audio-Technica ATH-ANC33iS QP are very similar to the previously presented model ATH-ANC23. 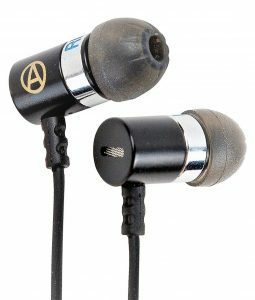 They have some design differences and the ATH-ANC33iS model is pricier, although still affordable for the pair of ANC earbuds. The biggest difference is that this model has inline mic and multifunctional button as well as volume controls on the ANC regulator. They weigh the same as ANC23 (1.5 ounces), while the cable is 4.6 feet long and it also has L-shaped 3.5mm connector. The earbuds come in a simple, partially opened box with AAA replaceable battery, airplane plug adapter, spare ear tips (silicone and foam) and soft carrying bag. ATH-ANC33iS have simple yet appealing design. The earpieces are angled and they seal the ear canal nicely. If you find them uncomfortable, you can try on some other silicone or foam ear tips. The earbuds are also quite light just like the ANC regulator. It even has some kind of a clip on the back side so you don’t even have to wear it in your pocket but attach it to the pocket or some piece of clothes. Besides that, the good thing is the possibility to turn on or off ANC according to your needs or wishes. The earbuds don’t look too durable, but they are. The sound quality is also satisfying although nothing more than average. The mids, highs and bass are ok, while the treble is great. The ANC works fine, but we could say that the passive NC is a bit better, although not perfect. The good thing is that they use AAA replaceable battery that can live up to 60h. After that, you just take it out and insert the new one. It is probably more practical than charging it all the time. One thing is sure – these earbuds have some serious flaws. It is advertised that the earbuds can eliminate up to 90% of the ambient noise, but it is far from the truth. They are actually not as good as it is advertised. Some other earbuds on our list of the 20 best noise cancelling earbuds do it much better. If you buy these earbuds, be prepared to hear some loud noises on the street. However, they are great for busy crowded offices. Besides that, the cord could be thicker and differently designed. It tangles a lot and it can produce microphonics. In addition, the bass can get pretty boomy and that is very irritating sometimes. Leophile Zero are ANC Bluetooth 4.1 earbuds that can be used as both wired and wireless. The battery requires to be charged for 2 hours and after that, you will have 20 hours of playback (with ANC off) or up to 15 hours (with ANC on) on your disposal. They are nicely designed and they weigh only 2.3 ounces, which is lighter than similar and more expensive earbuds. Talking about the price, the earbuds have quite high regular price, but they can often be found for far less money at discounts. The Bluetooth signal range is 33 feet max, which should be enough for most of the daily activities, even working out. The earbuds come in a nice silver/grey cardboard box. They are accompanied by leatherette carrying bag, cable clips, 2 spare pairs of ear tips in different sizes, auxiliary audio cable as well as USB charging cable. First of all, we do like the design of these earbuds. They have nice matte finish while the controls are highly accessible and easy to use. On the left side, you have multifunctional button and volume controls, while the USB charging/cable port and ANC regulation button are on the right side. The earpieces are nicely angled and they feel quite comfortable in ears. In case you don’t like the tips that come on the earbuds, try the other two pairs and you will definitely find the one that fits great. When it comes to build quality, we must say we are very satisfied. The earbuds are mostly made from plastic, while the neckband is covered with leather that feels quite pleasant to touch. The earpieces seem solid and they should be very durable. The battery is also durable, even with ANC turned on, but in case you run out of it, you have the micro USB to 3.5mm audio cable that you can insert into your phone or player and keep listening to music. Leophile Zero deliver such a great sound that can compete with some more expensive Bluetooth earbuds. Of course, we wouldn’t recommend them to audiophiles, but any ordinary customer will be completely satisfied. The ANC works nicely reducing up to 50% of noise even at the noisiest places you can imagine. They perform a lot better in airplanes or at offices. One of the rare flaws of the Leophile Zero are the non-retractable cables and significant neckband bouncing while working out. The good solution would be to make either retractable cables or build in the magnets in the earpieces in order to keep them in place while not in use. Besides that, we would like to warn you about some kind of hissing at high volumes when ANC is on. It can be annoying but that is the problem that most of the ANC earbud owners face all the time. Phiaton BT 220 ANC earbuds are quite expensive. 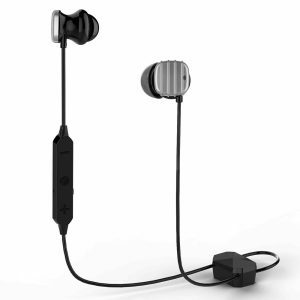 They are Bluetooth 4.0 earbuds with 33ft signal range and 1.2 ounces of weight (with the ANC regulator). They have relatively powerful battery that offers up to 10 hours of playback or talk time with ANC on or 16-17 hours with ANC off. Charging time is maximum 1.5 hours. They come in black/silver color combination, they have metal construction and they offer quite a lot (they can even be used as both wired and wireless), but the price isn’t neglectable. The earbuds come with 3.5mm audio cable, USB charging cable, soft carrying bag, one pair of foam ear tips, 4 pairs of silicone ear tips, user manual and a neck strap. One of the things we like about BT 220 is the design and metal construction. They have metal housings and metal ANC regulator that actually plays the role of Bluetooth module and remote controller. There is built in mic and one multifunction button on the front side. You use it for activating the earbuds, answering calls, etc. There are volume controls, ANC on/off switch, etc. The regulator is also metal and it has metal clip on the back side, which is used to attach the regulator to your clothes. The regulator connects to your phone via Bluetooth and the connection is quite stable. The earbuds are supposed to block up to 95% of ambient noise while the sound quality is quite good. They sound better with silicone ear tips as the foam ones destroys the treble. However, the soundstage is large and the earbuds are decently clear and pleasant. They also feel quite comfortable as the angled design doesn’t allow them to be stuck too deep in ear canal. That way they go only as deep as they have to in order to establish good stability. In our opinion and considering the price, the earbuds should have clearer sound with a bit more emphasized bass. It is nice that all the controls are on the ANC regulator, but we have to notice that the extension is a bit too heavy and bulky for wearing. Noise cancellation would be more effective if the earpieces could be pushed deeper in the ear canal. Marsno M1 are the first passive noise cancelling earbuds on our list of 20 best noise cancelling earbuds. They have 10mm drivers, metal housings, 130cm long cable and they weigh almost nothing (0.5 ounces). Considering the price, it is pretty surprising that so cheap earbuds can come in a fine and elegant cardboard box. Besides that, the earbuds don’t come alone. Marsno sends you user manual, many spare silicone ear tips in different sizes, cable clip, soft carrying bag and even some kind of ear hooks. The earbuds have very interesting and attractive design. They look stylish in all available colors (grey, blue and beige). Grey ones have shiny matte finish, blue ones shine brightly, while the beige ones look rather calming and neutral. The earpieces are made from aluminum alloy material and it makes them quite durable and solid. They are corrosion resistant while the oxygen-free copper Y-shaped cable blocks interference very well. It is rounded and not too thick but if feels very reliable. It ends with gold-plated universal 3.5mm connector. On the joint, you will find control pad with inline mic and one multifunctional button. If you press it once you can play music or answer call, if you press it once more, you will end the call or shut down the music. When you press and hold the button for 2 seconds, you can reject call; if you press it twice, you skip to the next song and if you press it three times, you can replay the previous track again. The sound quality is more than average considering the price and we must say we were mostly satisfied. Passive noise isolation works extremely well and many customers say that they can’t hear outside noise even at 50% volume. 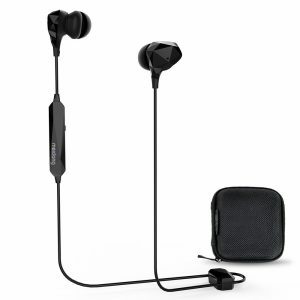 Marsno M1 are nice but not too practical earbuds. They do their job well but only if you don’t have great expectations. They will be great for casual use, but not so great for working out, especially running. Besides, their earpieces aren’t angled at all, which means they aren’t as comfortable as angled earbuds are. They also don’t have very stable ear hooks. If there were some ear wings instead or ear hooks attached to the tips, the earbuds would be stable enough even for energetic workouts. TaoTronics TT-BH026 are one of the best models of Bluetooth earbuds with passive noise cancelling technology. They weigh only 0.53 ounces; they have IPX6 splash proof rating, CVC 6.0 noise reduction technology and Bluetooth 4.0. 2 hours of charging enable up to 9 hours of playback time, while the MEMS mic makes sure your voice sounds crisp and clear. Besides that, we could say that they belong to the group of cheap earbuds. BH026 come in a heavy package with USB charging cable, one soft carrying bag, user manual, one cable clip, 2 spare pairs of ear tips and ear hooks/wings in different sizes. One of the things we like about these earbuds is the sleek design and metal construction of the earpieces. BH026 are simple earbuds that can be used in many situations. You can use them in both casual and official situations, even in the gym. Depending on your preferences and needs, you can buy black, blue, pink or red model. The earpieces are ergonomically designed, the speakers are angled and the tips and hooks are extremely flexible, soft and comfortable. Apart from that, the hooks provide extra stability and prevent the buds to slip out, so wearing these earbuds during running won’t be a problem. In addition, the magnets built in the buds enable you to wear them around your neck when you’re not using them. That way, they won’t be damaged and you won’t lose them. The build quality is great. The earpieces are metal, they have magnets inside and they seem quite solid. The control pad and the rounded audio cable seem also quite resistant, which they should be according to the IPX6 rating and nano coating. The earbuds are also very comfortable, but if you don’t find the tips that come on the earbuds too comfortable, one of the two other pairs should fit you well. When it comes to sound quality, we must say these earbuds are quite pleasant. They have nice and balanced sound. 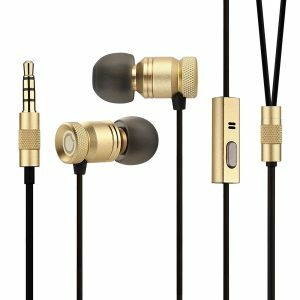 If you add CVC 6.0 NC technology and MEMS mic, you get great earbuds for small amount of money. We are aware of the fact that you can’t get perfection for a few bucks, but we would like this model to have ANC technology. Besides that, the battery should definitely be improved as the competition offers better and stronger batteries. Audiophile Elite are basic earbuds with average performance. They are not too bulky, the price is quite acceptable and the sound is completely satisfying. Audiophile is Chinese brand and they have many flaws, but we can’t say they deliver unpleasant sound. Their earpieces have two drivers. One of them controls low tones while the other controls the highs and the mids. The sound is not mind-blowing, but it is definitely among the best in this price range. The earbuds weigh 0.3 ounces and the rounded cable with no mic or controls is 1.2m long. The frequency response goes from 5Hz to 31kHz, the impedance is 16 Ohms, while the sensitivity is 118 dB. The earbuds come in a very simple cardboard box. The only thing you will get besides the earbuds are two spare pairs of silicone ear tips. What we like about these earbuds is their weight and sound quality. They are light, the cable is long enough to enable normal movements and the sound quality is better than expected. According to the impedance, the earbuds should be very loud and they really are. Besides that, they have quite powerful bass, but we are also satisfied with the mids and the highs that sound quite nice and articulate. In addition, these earbuds do have good passive noise cancellation; otherwise they wouldn’t be on our list. They may not have angled earpieces or go too deep in the ear canal, but silicone ear tips seal the canal nicely and block most of the ambient noise. On the downside, these earbuds don’t have good design, just like they don’t have good build quality nor they provide extra comfort. The design is very simplistic, but not in a good way. Audiophile Elite aren’t attractive and they don’t have inline mic or control pad, which means you will have to reach for your phone or player every time you want to adjust the volume, skip some tracks, answer calls, etc. In our opinion, the manufacturer has to has to improve this model and justify the price. Currently, they are way behind the competition. The earbuds also don’t provide satisfying comfort. It would be better if the earpieces were angled or if the tips were handled differently. It is most likely that your ears will start to hurt after a few hours. Besides that, the cable is not too durable and it is prone to tangling, which can be quite annoying. Mpow Jaws are very cheap Bluetooth 4.1V earbuds. The signal range goes to the standard 33ft, the earbuds weigh 1.2 ounces while the battery can offer up to 13h of playback or talk time. Besides that, the earbuds are quite comfortable, very portable and thank to the nice design, they can be used in many different situations (at home, at work or for recreation). They are also available in black and violet colors. Mpow Jaws come in a simple box with USB charging cable and spare ear tips in different sizes. One of the most interesting thing about these earbuds is their design or, to be correct the model used for making the earbuds. The manufacturer made the headphones look like the jaws of a shark and that’s the reason why the ends of the neckband look like small jaws. The neckband is light and pleasant for wearing. On the right side of the neckband, there are volume controls while the track control buttons are on the left side. 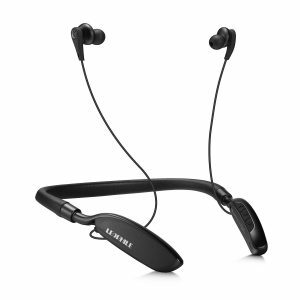 The audio cables come out from the neckband and end with square-shaped angled earpieces. Each end of the neckband has built-in magnets that hold the earpieces. That way, you will be able to wear the earbuds around your neck even when you’re not using them without worrying about damaging them. The Jaws are made from plastic mostly, while the neckband is made from some kind of silicone, which is very pleasant and flexible. They are quite comfortable and you won’t have problems wearing these earbuds even for several hours straight. The sound quality is more than satisfying. You probably wouldn’t expect to get so durable earbuds that also sound good and have great battery life for that kind of money. 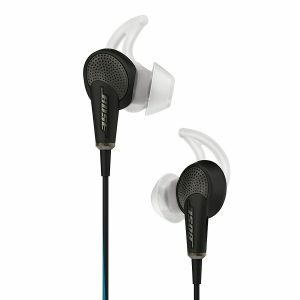 Besides that, their CVC 6.0 passive noise cancelling technology works nicely and shuts out great amount of ambient noise. The truth is the earbuds look a bit bulky in ears. We also can’t recommend them for working out, maybe just for weightlifting. 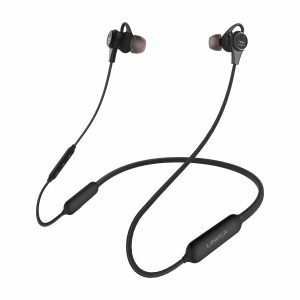 If you want earbuds for running, you better consider different model as these have the neckband that will be bouncing around your neck all the time. 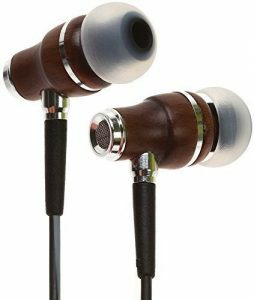 If you take into consideration, that many instruments are made from wood, it is no wonder why the next product on our list of the best noise cancelling earbuds is Symphonized NRG 3.0. Symphonized is the company famous for its wooden headphones. They make them in all sizes from different kinds of wood, they have affordable as well as expensive models but all of them are very specific and interesting. Symphonized NRG 3.0 have inline remote controls and mic, they weigh 0.4 ounces, the Y-shaped cable is 4.3ft long and it has 3.5mm angled connector. The earbuds come with differently colored cables and you get to choose between 7 colors (black, red, orange, yellow, blue and purple). The earbuds come with very nice soft carrying bag with Symphonized logo and 6 pairs of silicone ear tips in different sizes. One of the things you must love about all the products made by this company is design. They may not be the best headphones on the market, but they are unique. Wooden earpieces make them look good and even more durable than usual plastic models. The earbuds are quite comfortable and adequate for different kinds of activities, even for moderate exercising. The cable is thick, nicely rubberized and it seems quite durable. The earbuds sound quite good. They aren’t audiophile-friendly earbuds, but the bass, the mids and the highs are decent and the sound is not too distorted. The noise isolation is also decent, although they act better in moderately loud environment like office or some quieter places. One of the things we can resent Symphonized is the combination of colors used on NRG 3.0 model. It is great that we can choose between many different colors, but not all those colors match perfectly the color of the wood used for the housings. For example, we can hardly imagine that anybody would like to match purple or pink with brown, but at the end, it is all a matter of taste. The earpieces are straight and it would be better if they were angled as the tips would enter the ear canal deeper and make better seal. In addition, the sound could be clearer and the soundstage should be wider. The bass could be calmer and quieter, while the mids could be less muddy. NRG 3.0 aren’t very stable. Angled design or some ear wings/hooks would help a lot in this situation. The earbuds can be used for moderate workouts, but nothing too excessive like running or jogging. 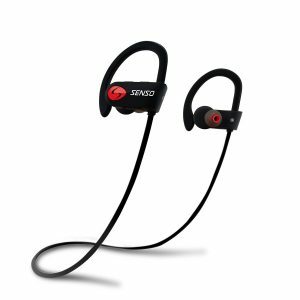 Senso ActiveBuds S-250 are relatively cheap Bluetooth earbuds with passive noise cancellation technology that can be used in almost any situation. They have sporty looks so you don’t have to keep them at home. You can take them for a run, to the gym or on a trip. They weigh only 0.2 ounces; their battery offers 8 hours of playback or talking time after 1.5h of charging. 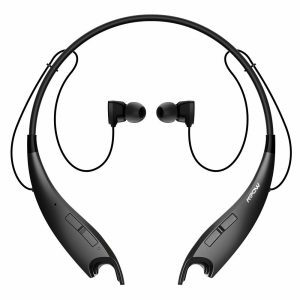 The Bluetooth signal stays stable at 30ft distance and they have IPX7 waterproof/sweat proof rating. With these earbuds, you will get rid of annoying cables and you won’t have to reach for your phone/player when you want to turn up the volume, answer a call or skip a song; all the controls are right there on the earpieces. The earbuds come with a car charger, three pairs of ear tips in different sizes, short charging cable, cable clip, 3ft long charging cable and a sturdy carrying pouch. S-250 are attractive earbuds. They have sport-friendly design and they are available in black/red color combination. The earbuds look comfortable and they truly are. Not only because of the soft plastic built that makes them flexible and pleasant for wearing, but also because of the accessibility of control buttons and the fact that they are wireless. The big round red button with Senso logo is the multifunction button, while the volume controls are on the top of the earbud. The speakers are covered with soft silicone ear tips. They come in S, M and L sizes. When you find the right size, achieve better sound quality, more efficient noise isolation as well as more stable fit. The soft and flexible silicone ear hooks that go over your ears improve the stability. They keep the earpieces on their place and prevent them from slipping out from your ear canal. The earbuds have good built quality in spite of being plastic. The IPX7 rating improves their resistance to damage a lot. They are also so comfortable and light that you can wear them for hours. You can even use them for workouts, as they won’t be damaged by sweat or a splash of water. The cable is flat and tangle-free and the car charger is made entirely from metal, so it should be quite durable. However, Senso gives you 30-day no-questions asked period and 1-year warranty period so you can return the earbuds if you have some problems with them. Senso ActiveBuds sound great. They are not perfect, of course, and you can’t expect perfection from so cheap earbuds, but the bass is deep and the highs sound amazingly clear. The mic also works nice, just like CVC 6.0 passive noise cancellation technology that shuts out great amount of background noise. ActiveBuds S-250 are very popular earbuds and there are many reasons for that. People trust them and the earbuds have proven to be quite reliable. However, we must warn you that they aren’t completely waterproof in spite of the IPX7 rating. They can survive rain and sweat, but you can’t use them for swimming. Besides that, we would like to notice that the mids are quite muffled, although the earbuds generally sound very good. 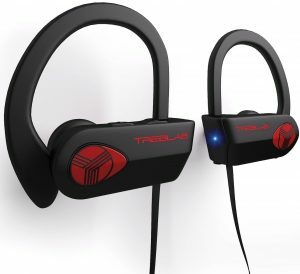 XR500 are Bluetooth earbuds by Treblab. They have similar design to many other wireless earbuds on the market but they do come in a range of vivid colors (white, black, pink, black/silver and purple). They have big earpieces with ear hooks, which implies they were made to be used for sports. 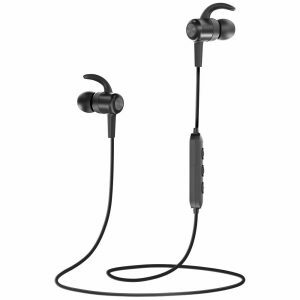 Besides that, these earbuds have IPX7 rating, which means they are waterproof; they weigh 0.6 ounces, Bluetooth signal range is maximum 38 feet, while the battery can live for 9 hours after 2 hours of charging. The earbuds come with 6 pairs of ear tips (silicone and foam), sturdy carrying pouch, USB charging cable as well as cable clip. Treblab XR500 are nicely designed and well-built earbuds. The earpieces have angled speakers with replaceable silicone tips that lay nicely in ear canal while the flexible silicone ear hooks that prevent the earpieces to slip or fall out of your ears. The earpieces are large but light and all the controls are highly accessible. The big round button with Treblab logo is there to control pay/pause, answering calls and pairing process. You also have volume controls and built-in mic. The audio cable is long enough; it is flat and tangle free. In case you find it too long, you can always use cable clip to shorten or attach it somehow to your clothes. The build quality is more than satisfying. The earbuds are made from plastic and silicone, but the complaints about durability were quite rare. Anyway, if something happens, you can use 30-day return policy and get new pair of earbuds. The earbuds are resistant to sweat and splashes of water and they can even be submerged into 1-m deep water, but not for too long. When it comes to sound quality, Treblab XR500 sound quite good. They aren’t made for audiophiles but the sound is very crisp and clear while the bass is pleasantly emphasized. The mids are clear and distinctive and the CVC passive noise cancelling works very nice blocking most of the background noises. First of all, the connection is not always stable. The signal range is good without obstacles, but the cutouts can appear if the phone is in your pocket. Second of all, the play/pause button has tricky position. The earbuds tend to slip out if you are sweating. When you try to push them back in, you might end up pressing the multifunctional button and pausing your music or disconnecting the earbuds, so be careful with that. GGMM Nightingale are cheap wired earbuds with 8.6mm dynamic drivers. They come in several colors and color combinations (black, white, gold and grey/red). It has TPE 3.9 ft long cord with straight 3.5mm connector. The earbuds have inline mic and one multifunctional button on the right side of the cable. If you press it once, you answer/end calls, play or pause music. If you press it twice, you skip to the next song; three clicks enable playing the previous song again wile long press for 2 seconds rejects calls. There is also inline mic, which is great as these earbuds allow you to answer any of you calls hands-free. The earbuds come in a nice simple cardboard box with 3 pairs of silicone ear tips in S, M and L sizes, soft cloth carrying bag, user manual and warranty card. There are also some versions that come with a nice faux leather case. You put the earpieces in there and wrap the audio cable around them. After that, you just close the case and you are ready to go. The case is small but solid and it prevents the earbuds to tangle or be damaged while not in use. One of the things that we appreciate very much is the metal housing, metal control pad and solid connector. They are quite small and they don’t stick out from the ear too much. The cord is long enough to enable normal movement while the 3.5mm connector is thin. That is important because you will be able to plug it into your phone even if you’re using phone case. The tips are available in different sizes so you can try them all and see if some pair fits better than others. The important thing is to achieve perfect seal in order to block as much noise as possible. However, these earbuds block the noise amazingly good for the price and they are also quite comfortable. They sound nice and pleasant. The bass is not too emphasized but the sound in general is well balanced. GGMM Nightingale earbuds are sold as “deep heavy bass” earbuds, which they really aren’t. The bass is more emphasized than the mids and the highs, but these are not bass earbuds. The cable seems to be quite durable, but it is very thin and it tangles easily. That’s why it is important to keep them in their case to prevent extra tangling. We also have some complaints about the design. The earbuds should be angled, the control pad should be bigger and the controls more user-friendly. We can’t say they are too complicated for use right now, but it would be easier if the volume controls and play/pause button were separated. Besides, it is easier to damage one button that is constantly used than three that are used equally. CX300 are noise isolating earbuds by Sennheiser. They are small, lightweight but quite powerful. Their frequency response spans from 42Hz to 17kHz, the impedance is 16 Ohms, while the SPL is 113 dB, which means they can be quite loud. The audio cable is 3.9ft long and it comes with 3.5mm L-shaped connector. 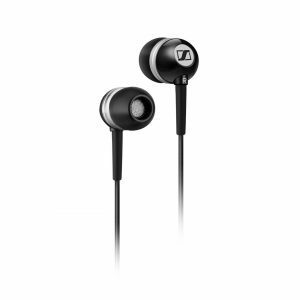 The earbuds come in black color and they have more than acceptable price for a product made by Sennheiser. The earbuds come in a small, transparent and quite cheap plastic box. They are accompanied by 2 spare pairs of ear tips in different sizes, 2-year warranty card and one small protective carrying bag. Sennheiser CX300 II are simply designed black earbuds. They are quite small and they definitely won’t stick out from your ears. The earpieces are nicely shaped and there is a variety of spare tips that you can try on to achieve better seal and fit. There are hard plastic cable reinforcements below the earpieces and the connector. The build quality is more than satisfying; even the cable is quite durable in spite of being very thin. The earbuds feel quite comfortable and light, but they also manage to stay in ears even if you use them for physical activities such as jogging. The sound quality is great. The bass, the mids and the highs sound more than it could be expected from the budget Sennheiser model. It is well balanced, quite clear and pleasant. The ear tips seal ear canal nicely and block passively great amount of ambient noise. CX300 II aren’t the best Sennheiser model and they aren’t full-size headphones, so don’t expect mind-blowing sound. It is advertised that they have strong bass, but it really isn’t that strong. However, it is pleasantly enhanced. The audio cable is strangely asymmetrical. It is Y-shaped but the right side is longer than the left side. The idea was to wear the right part of the cable behind the neck, but in reality, it is not so comfortable and practical. Besides, there is no inline mic nor remote controls, so you will have to use your phone for all the settings you want to adjust. Noise cancelling earbuds are becoming more and more popular and that’s the fact. However, the technology is still being improved and it still has many flaws that should be eliminated in the future. Until then, we can still talk about the positive and negative sides of noise cancellation in all its forms. Here are some of them. First of all, we would like to mention the volume level. Let’s imagine your headphones don’t feature noise cancelling technology and you are walking or working in a noisy environment. You are constantly annoyed by the noise, human voices, horns, the sound of car engines, etc. The only logical thing to do is to grab your phone or control pad on the headphones and turn the volume up to the maximum trying to shut out that annoying loud world. It seems like the only possible thing to do, doesn’t it? Well, it gets much easier if the headphones feature noise cancelling technology, especially if it is active noise cancelling technology (in the first part of the article, we have explained how these technologies work). This technology eliminates loud background noises but still enables listening to music or any other audio content at normal volumes. It keeps you safe from hearing loss and lets you enjoy your favorite melodies. Second of all, active noise cancelling headphones are the best possible companion during long trips. As they shut out low volumes best, they are perfect for eliminating engine noise in a bus, car or airplane. You won’t get a headache, you will be able to relax or even work and if you travel a lot with small children, you can also use these headphones to keep them calm and occupied. It is well-known that small children can get headaches from that kind of noise, especially in airplanes. If you want to avoid uncomfortable situations and enjoy your trip as much as possible, give them active noise cancelling headphones and the problem will be solved soon. Last of all, active noise cancelling earbuds help you concentrate on anything you need to do. That’s the reason why they are so popular among business people that work in crowded offices and have to do their tasks in spite of the constant noise around them. Imagine all those colleagues walking around, talking, exchanging ideas, asking questions, etc. Active noise cancelling earbuds can be great solution as they shut them all and help you do the tasks before the deadline. Besides that, these are often used among students that usually try to learn something in libraries or noisy rooms at the university. Just bear in mind that your headphones shouldn’t leak a lot of sound because you don’t want to disturb other people. On the other hand, as all technologies, noise cancelling has some important flaws and downsides. First of all, we would like to mention high prices that some models of branded active noise cancelling headphones might have. Even if you have enough money to spend on some branded ANC headphones, that doesn’t guarantee the quality. Some of the less expensive models have proven to be even better than expensive ones. We are aware that many ANC headphones have reasonable prices, but they are still higher than the prices of regular headphones. Second of all, there is the hissing or humming that might appear while using active noise cancelling technology. Hissing mostly appears on higher volumes. It is supposed that you don’t have to turn up the volume so high if using ANC, but in case you love loud music, it can be quite annoying and most of the noise cancelling headphones have this problem. Besides that, those strange sounds can make you force your ears to hear the music better, which leads to the unwanted stress for your ears. Third of all, active noise cancelling headphones use more power than regular ones and that can drain out your phone’s battery faster than usual. Their batteries are placed in a separate small regulator on the audio cable and that can be uncomfortable for wearing, make the headphones less portable and add them some extra weight. In addition, noise cancelling headphones are less safe than the regular ones. Active noise cancellation if completely safe if you use it in closed rooms, but it can be tricky if you use it in the street. You are less aware of the situation around you, you are focused on your music and it might be more difficult for you to notice some dangerous situation before is too late. Last of all, active noise cancellation does not cancel all the noise. It is well-known that ANC is best at eliminating low frequency tones, but it has certain problems with high tones like cry of a baby or something similar. In those cases, passive noise isolation can help, but you should be aware that even with both types of noise cancelling technology you will be able to hear some noises. As we understand that it is quite difficult to be confident and find the best pair of earbuds in the bunch of different models, we have prepared some basic guidelines for you in order to make the search at least a bit easier. Comfort is one of the most important characteristics of anything we have, especially something that messes up with our hearing. Any headphones should be comfortable, especially earbuds as they are inserted in ear canal and can cause more damage than over-ear or on-ear headphones. The only problem is that comfort is relative term and it is more subjective feeling than a fact that implies equally on everyone. Some people will claim that certain earbuds are extremely comfortable and that they can wear them for hours. However, that doesn’t mean that the earbuds that are comfortable for everyone else will also be comfortable for you. That’s the reason why it would be perfect if you could try the earbuds before buying them. In addition, always look for the earbuds that come with several different ear tips in different sizes as it will be easier to find the right size. For example, all the models on your our list come with spare ear tips. Good seal is crucial for any noise cancelling earbuds, especially those that use only passive noise cancelling technology as it depends only on the physical shape of the earpieces and ear tips. If the ear tips don’t fit, you won’t feel the effect of noise cancelling technology and you will be disappointed. Of course, the best fit means good seal but the tips shouldn’t be too big as they will put unwanted pressure on your ear canal and it can be really painful. The last but not the least, there is battery life. Only ANC earbuds use special batteries and no matter if the battery is rechargeable or replaceable, it has to offer as many listening hours as possible. That way you won’t have to worry all the time if you will run out of it, if it will last until the end of your trip, workout, etc. Battery life should be adjusted to your needs and the time you use the earbuds on average, so choose the earbuds with the battery that can follow your schedule. To conclude, here you have 20 models of different kinds of noise cancelling earbuds that are currently the best on the market. 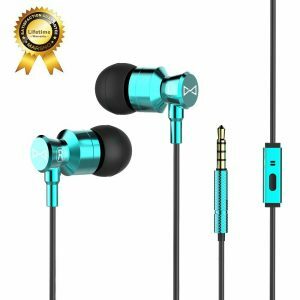 We have made this selection for you in order to shorten the time you would otherwise spend searching for the best earbuds for you. We hope you will find something interesting and enjoy it for a long time. Always happy to help. We hope you’ll like them. Thanks for writing this great and detail reviews for noise cancelling earbuds. Do you have a list of best noise cancelling headphones and what model do you recommend? We have a list of best cheap noise canceling headphones under $100. Out of those on the list, we would recommend Paww WaveSound 3 and all the headphones from the TT-BH series. Also, Cowin E7, E7 Pro, and E8 are pretty good. If you are looking for something more expensive, you should check out Sennheiser HD 4.50 or PXC 550. Also, Bose Quiet Comfort QC35 and Sony WH1000XM3 are some of the best. Which one is better ovc h15 or taotronics ep02 and why. Is there any other better option in the same price range. I like bass and long usage of headphones. I dont like it falling out of my ear. Out of those two models, TaoTronics EP002 is definitely better. It provides better noise cancellation and it’s bassier. It’s also built better and look more durable. Two things we can’t be absolutely sure about are comfort and fit. It all depends on your ear shape and size, but we had no problems. TT EP002 is a pretty good pair of earbuds and it’s probably the best option under $50.